Cold weather hunting is always better when it ends well. It was cold! This doe came in with another doe at about 5:00PM and I got a 10 yard shot. I made a perfect shot through some brush but thought I had hit low and waited to track it. This was a mistake as coyotes found her before I did. We started tracking just a few minutes after dark so they must have found her right away. The area we hunt has coyotes everywhere! Anyway, she ran about 150 yards and I was glad for the snow because there was very little blood. The coyotes got the right shoulder and right thigh but we still got some 2/3 of the meat. I am glad I didn't wait much longer or she would have been gone! Having a good friend and my little sister along for the tracking job made for a wonderful moment. Zwickey 2 blade eskimo, Bear 1963 Kodiak Mag 55#@28 and GT arrows. Way to go! I had a similar incident with coyotes a couple seasons ago. They got to mine in under an hour and a half! grestjob!!! think we need a tradgang week of nothing but killing them damn yotes!!! Nice Doe!! dang yotes,had the same thing happen several years ago.Good you got to her when you did. That's happened to me to before too. Man I hate those dogs. Glad to see it was not a total loss. 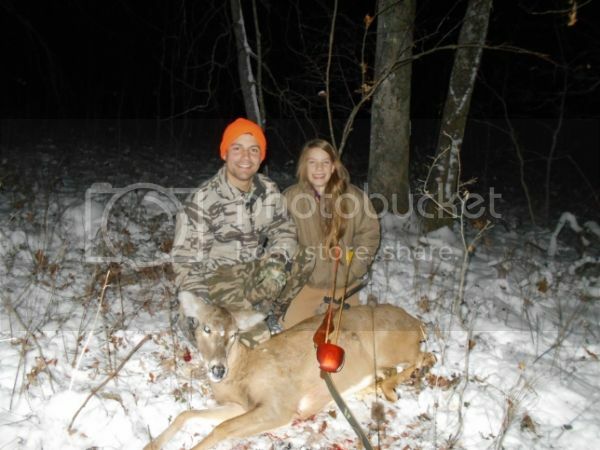 Congrats on a nice doe!! Nice deer Michael! All of the deer I have been seeing and the one I took are somewhat small compaired to the last couple of years. We are hunting around Shattuck and Gage. I took one with my pistol during that first snow before Thanksgiving. I have my bow tuned up and I'm ready to try for another. Great photo. Wish I could get my sister to come with me but she has both knees that are bad due to Softball. Oh well, I still take her a deer each year. Stay after them. By the way, what part of the state did you take your doe? Some of us made a try at Kaw Lake in October and some of the guys saw good deer but only one got a shot and took a doe. Glad you got there before it was all eaten up. Also happy you shared the track with your sister. Congrats on a nice doe taken with vintage equipment. Very nice, always nice to share the recovery with family!